We eat a lot at our house. Which I’m sure most people will say about themselves, who have been blessed with access to bountiful funds and modern grocery stores. But for two people who have passed the adolescent growth spurt years, the amount of food consumed on our property is intense. My husband (bless him) has to consume around 3,200 calories a day just to maintain his weight and energy levels. (that’s a lot of calories: generally 3,000 calories = 1 pound of weight on the average person) Feeding him is like a sport. You cook enough for 4 average, reasonably hungry adults, possibly 6 that have restraint. You serve yourself a moderate amount. Then Aaron bats cleanup and the meal that would feed most couples for two, possibly three really skinny days, becomes one. It’s a constant source of amazement for those unaccustomed to his food-vacuum ways. Which means I cook a lot. Because I’m morally offended (dramatic, I know, chill out already) by fillling the vast calorie expanse with calorically dense/nutritionally void processed and fast food, it means a lot of home cooking. Maybe 4-5 nights of meals where some type of heated food assembly is involved, with 1 night of cobbled together leftovers and 1 night for takeout. And we usually eat the same thing, over and over again. In the fall/winter months, it’s lots of soups and stews with grilled chicken and roasted root vegetables. In the summer, lots of salads, summer veggies and summer fruits like blueberries and peaches and cherries and whatever cheap protein or grain fillers are around. I’ll talk more later about our weekly menus, and how I can time manage 4-5 home cooked meals a week(lots of prep!! ), but for now I’m going to share a weeknight dish that’s become one of our favorites. It’s relatively cheap, easy, leaves only one dirty pan at the end of the night (!! ), and hits all the food groups and flavors. It usually leaves both of us licking our plates at the end, a sure sign of success. It’s also a really good way to use up some summer produce! Sort of related: I think I wanted to originally call this Greek nachos, because that’s what we started calling it at home. But other than the Greek yogurt, I’m not sure you could call this Greek food, it’s channeling more of a Mediterranean flair. Whatever. I do what I want! This recipe by Deb originally inspired our dinner, but I’ve liberally adapted it to make it more friendly for our stomachs and schedules. The combination of flavors is perfect to me: the salty crunchiness of the chips, spicy warmness of the chicken and beans, the fresh crispiness of the vegetables, finished with a cool tanginess from the yogurt sauce. It will feed 4 moderately sized adults with self control, or me and Aaron on a weeknight. Set a heavy bottomed pan on the stove and coat the bottom with a thin layer of olive oil, turn the heat to medium. Set your chicken strips in the pan, and sprinkle with the salt, pepper and spices. Brown on both sides, cooking the chicken until the juices are clear and the meat is completely white, not pink, in the biggest, thickest piece of chicken. Set the chicken aside on a separate plate. The chicken will look yellow on the outside, this is because of the spices. While the chicken is grilling, chop your vegetables. 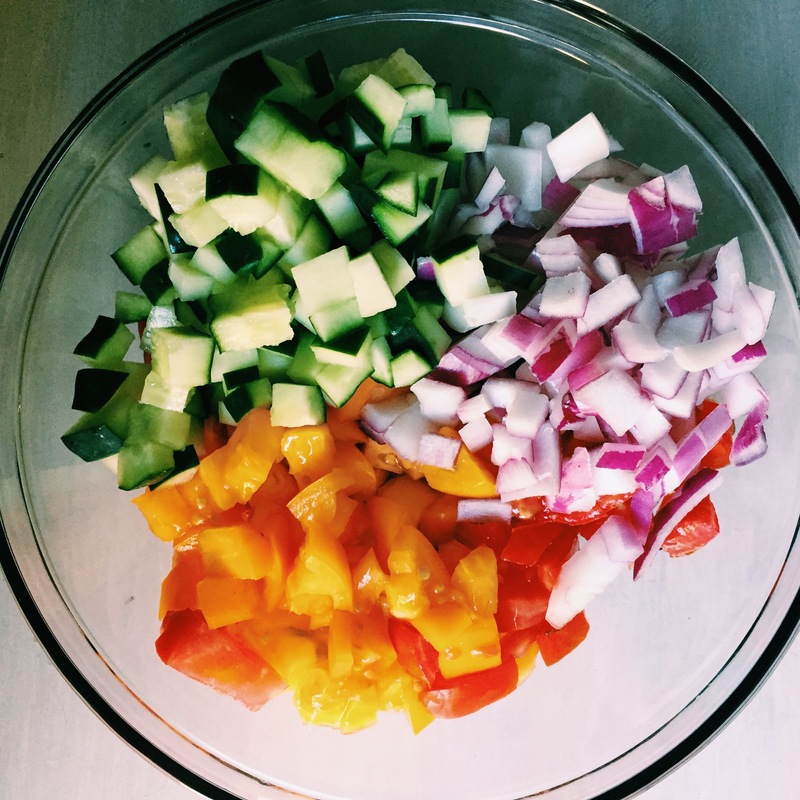 Toss the tomatoes, cucumber, purple onion in a medium bowl with the lemon juice and olive oil, add salt and pepper to taste. Set aside. Whisk the yogurt with the herbs and lime juice in a small bowl, and set aside. When the chicken is finished, in the same pan (!!) sauté the onions until tender. Add the garlic and cook for just a couple minutes more. Add the entire can of chickpeas, with its juices, to the pan. Add the spices, and let simmer on low for 10-15 minutes, or until very tender. Just don’t forget about them and burn half of them, resulting in a thick layer of burned chickpeas sticking to the bottom of the pan, which is what happened this past Monday. Spread chips or pita chips on a plate and layer with shredded chicken, vegetables, chickpeas and top with yogurt sauce. Enjoy!